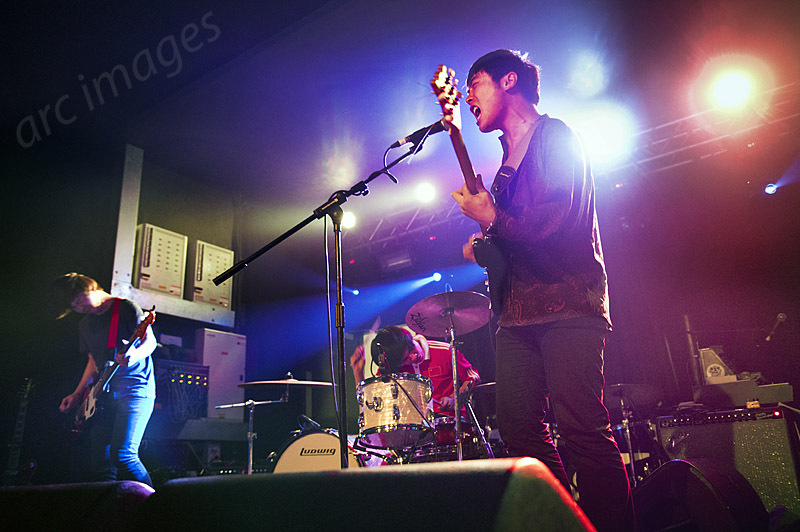 Tonight’s support act Birdstriking must be ‘a first’ for Gig Junkies: a Chinese indie band from Beijing. And very good they are too. Led by talented singer and guitarist He Fan, the band must surely win a lot of new fans tonight, judging from the audience reception. Listening to the power of their songs and He Fan’s distinctive guitar-playing style it’s not surprising. – Review by John Bentley. 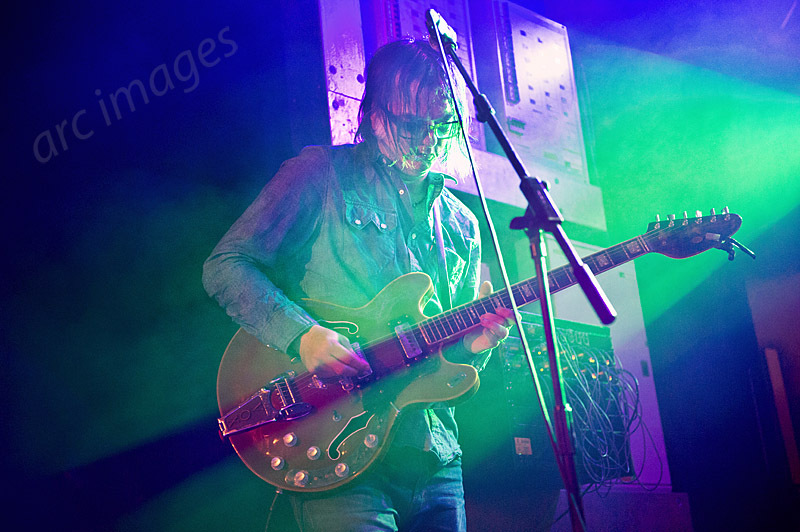 The Brian Jonestown Massacre produce 1960’s inspired psychedelic rock with “shoe gazing” indie tendencies whilst straying into other genres at whim their Byrds’ influence is never far away. 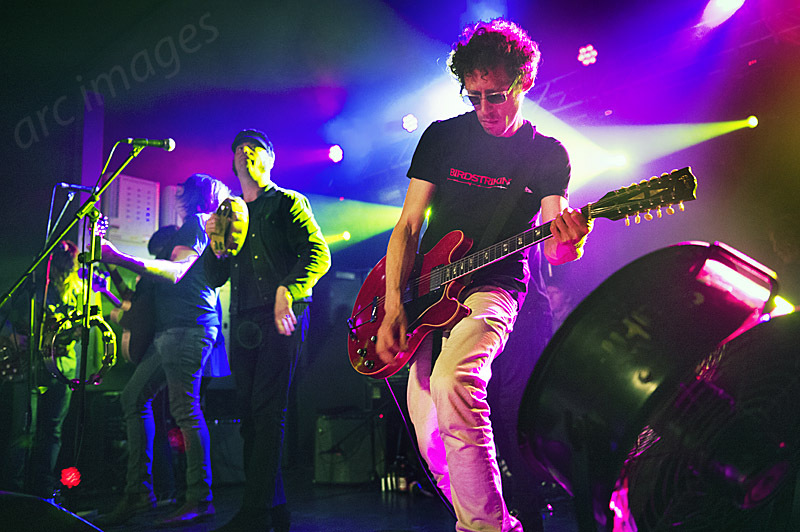 This set spans the majority of their lengthy career including their recently released album Revolution, which pleases most of the audience who appear to be fanatical about the band. The second track in, Who?, starts with elated vocals calling out a high pitched who throughout the venue whilst the instrumentation presents a pleasant groove. Clearly the band is a well-rehearsed unit that produces a large wave of sound, which is not surprising considering the number of instruments on stage often playing the same rhythm; however, this use of multiple instruments does create warmth and allows for subtle nuances throughout the set. 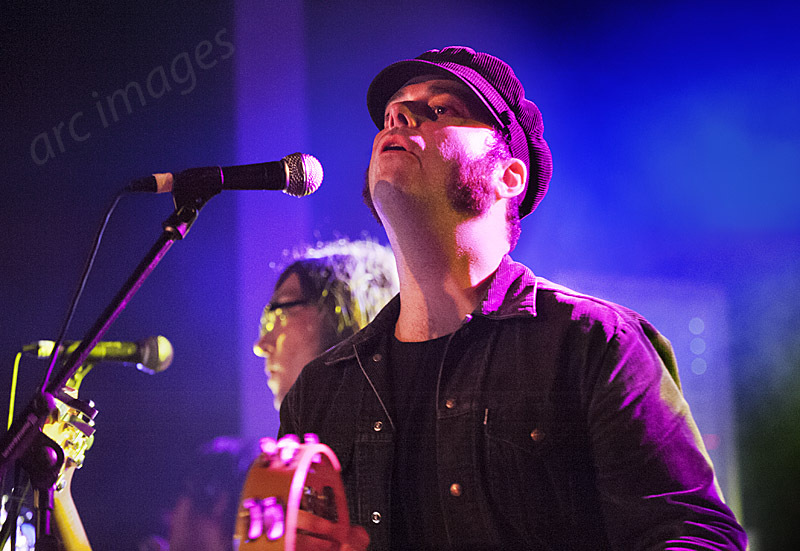 Joel Gion’s role is one of percussionist which he undertakes in an aloof manner and initially, I questioned his involvement as more of a gimmick yet as the gig continues it is clear that the music would be missing a critical element without the prominence of the tambourine, maracas and wooden blocks. Until The Devil May Care (Mom and Dad don’t), the lighting had been very simple, dowsing the band in vivid primary colours, but as the song draws to a close white spotlights shine from behind the band creating silhouettes which add to the haunting atmosphere and see the audience relish the opportunity to join in the singing. Newcombe keeps chat to a minimum resisting the urge to pronounce on his political views, however, before proceeding with Anemone, he quotes from Simon and Garfunkel’s Sound Of Silence and then advertises Gion’s solo album and tour later on in the set. Sailor sees Campanella’s skill on the keyboards come to the forefront during the solo which cuts beautifully through the guitars and then flows into Oh Lord. 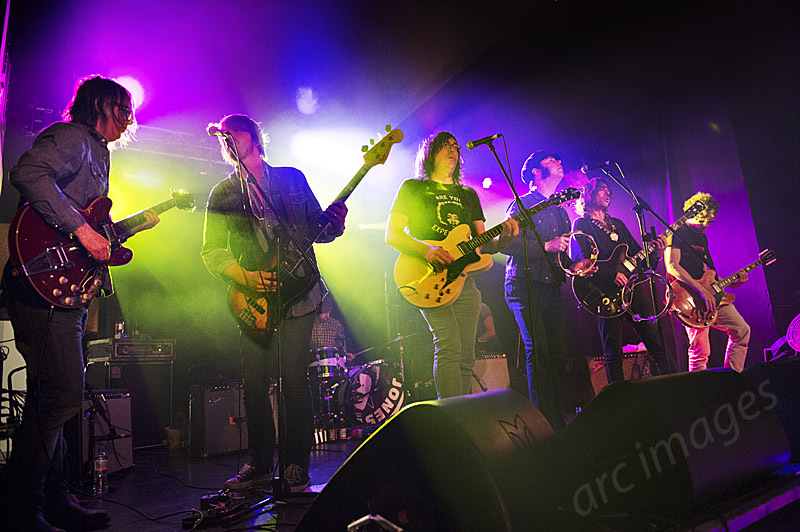 This being one of The Brian Jonestown Massacre’s more catchy numbers sees the audience become increasingly more animated, and the movement continues until the end of the set. The final tracks of the twenty two song set list are Down which segues into When Jokers Attack creating the most interesting pieces of the evening, descending into a melee of feedback and distortion whilst strobes and lights fly around the venue. Slowly, one by one, the band exit the stage thanking the crowd as they go, leaving the lone figure of Newcombe experimenting with sound until a member of the audience jumps on stage to give him a hearty kiss on the cheek. 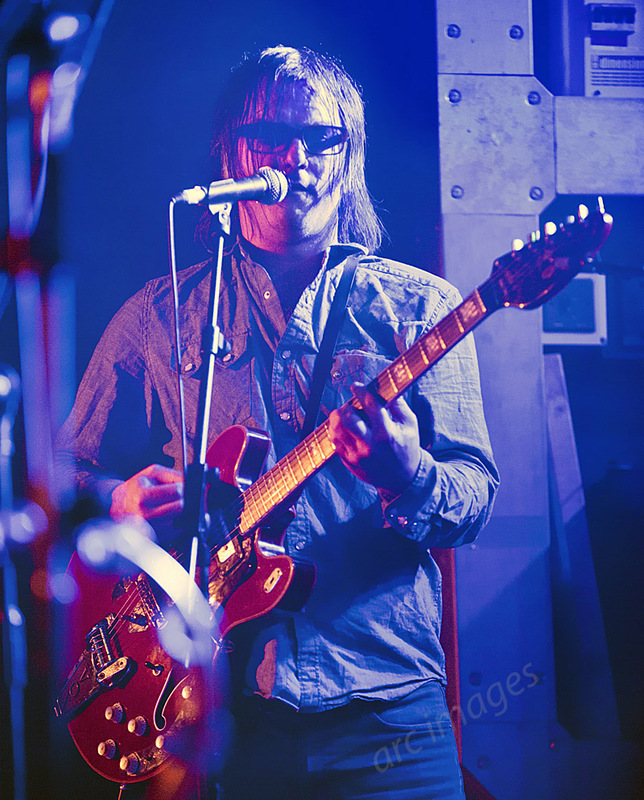 Before leaving the stage, Anton films the crowd’s euphoric response to The Brian Jonestown Massacre’s two hour set. The Brian Jonestown Massacre are a prolific band and their cult status attracts fanatics who appreciate such a lengthy performance, however, I have to admit to losing interest at points during the evening due the rhythmic monotony of their music and would have much preferred a more concise set. Saying that though, mine is a minority view and it was clear throughout that most people were relishing the trance like state being induced by a collective of talented musicians.